Sometimes you want more than just good food, you want to let your hair down and have some good old fashioned fun. 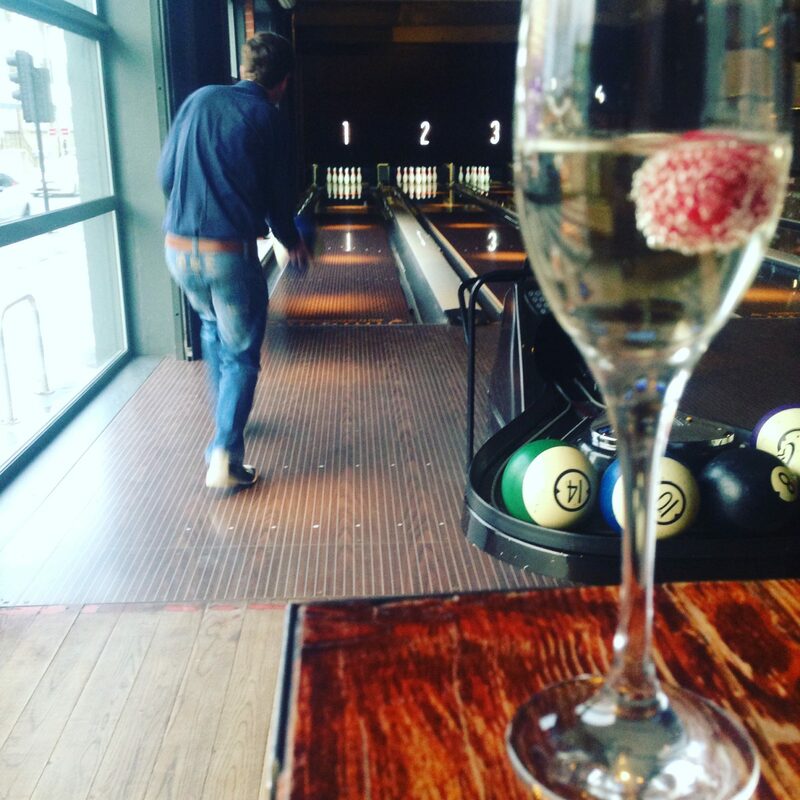 In Newcastle we’ve got somewhere that aims to combine the two – Lane 7, the ’boutique bowling’ alley. 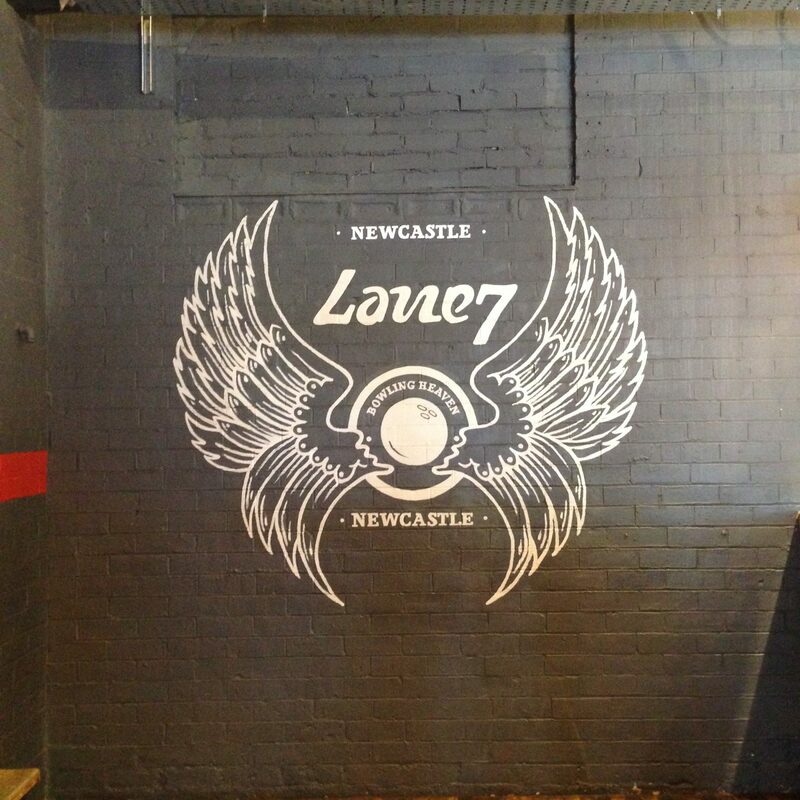 Open for nearly three years and a staple part of newcastle’s hipster scene, if you’ve never been to Lane 7 erase all thoughts of smelly bowling shoes, Formica tables and cheap hot dogs. Having been a few times before and thoroughly enjoyed myself, I was interested to see if the food would still hit the spot given the departure of Head Chef Chris Finnigan (now at Branches restaurant in Ponteland) who had given the place its foodie credentials. Rocking up to Lane 7 on a Friday night; the place was buzzing with a cool crowd of twenty somethings. The interior of lane 7 is more akin to a trendy eatery than a bowling alley; plenty of wood, exposed brick and punchy murals on the wall. We were greeted by young trendy plaid-clad staff who got us some (thankfully odourless) bowling shoes and showed us to our lane. We ordered our drinks and got down to bowling (around £7 each a game). My bowling skills leave a lot to be desired at the best of times, but drinking prosecco while doing so probably didn’t improve them! The Mr was driving and ordered a ginger beer, which caused a bit of confusion with our waiter (no, not an alcoholic ginger beer) and resulted in a mixer-sized ginger ale being served. We finished our game (I lost, badly – fully blaming it on the two glasses of prosecco) and we headed to our table in the bar area. We’d missed out on a table in the restaurant as we’d only booked a couple of days in advance (this place is popular!) But we were happy to be sat in a quiet part of the bar, next to the window. 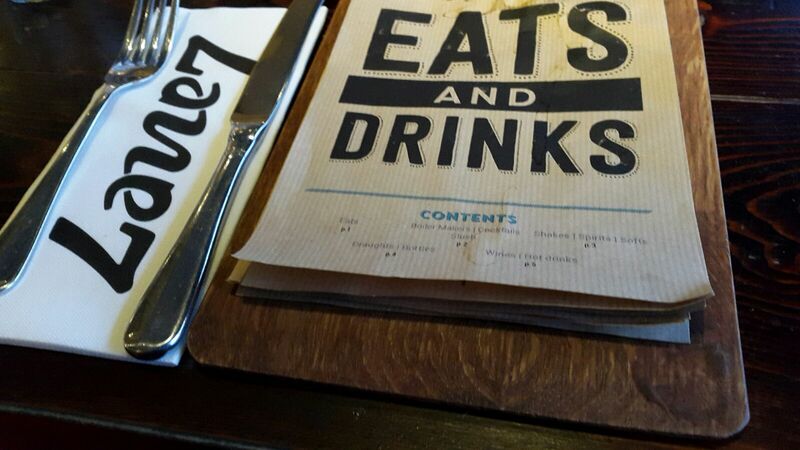 We checked out the menu, which has gained popularity due to the attention to detail Finnegan placed on well executed dishes and consists of American diner style grub – think ribs, burgers and hot dogs. There isn’t a huge selection and there wasn’t a lot that excited us, probably because this whole American trend has gone on for so long and everywhere seems to still be on the ribs & ‘slaw train. 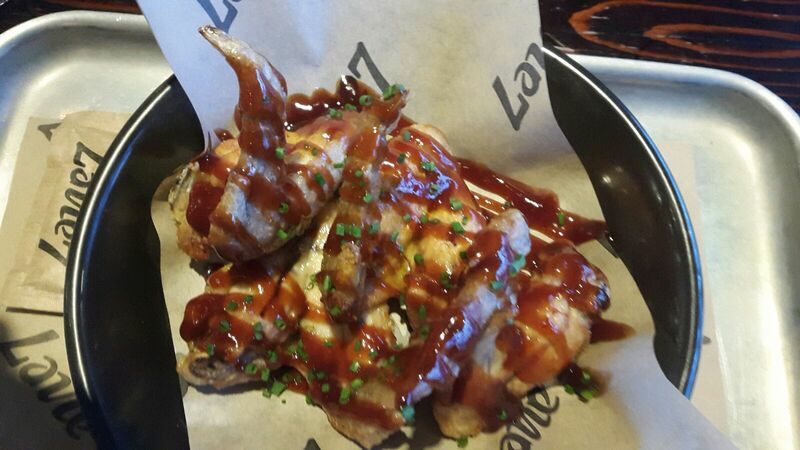 We settled on the deep fried chicken wings with BBQ sauce starter to share (£5). They caused a little confusion when our waitress (holding them in her hand) asked if we’d ordered the nachos. We quickly cleared up that they were in fact chicken wings and got stuck in to the messy business of demolishing them. Not first date food, this. The wings were crisp on the outside, with little seasoning and no batter so the focus was on the meat. They were cooked just a bit longer than we would’ve liked, rendering them a little on the dry side. They were finished off with some pretty standard BBQ sauce. All the main courses came with a choice of either one or two sides. 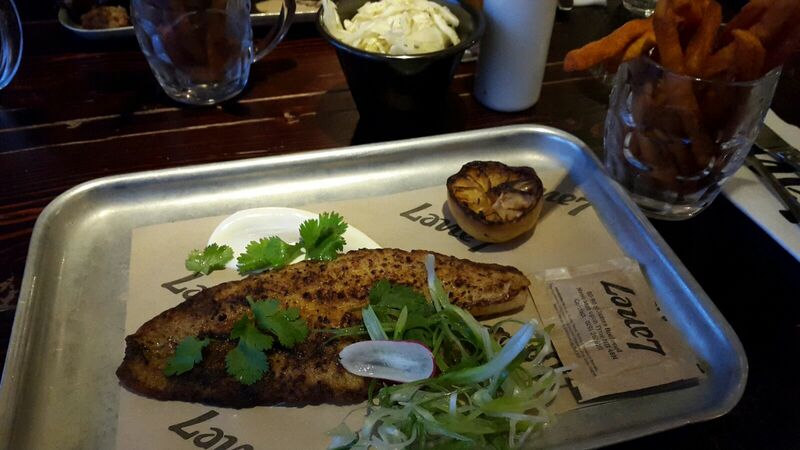 I went for Cajun catfish with 2 sides – green chilli slaw and sweet potato fries (around £14). The Mr went for beef ribs with corn on the cob and fries. Our waiter came back and told us they were out of beef ribs, but he suggested the pork ribs so the Mr reluctantly went for those instead. I was impressed by the catfish. It was cooked to perfection and the Cajun seasoning was enough to give it a bit of oomph without overpowering the fish. The slaw was good but lacked the kick the waiter had alluded to when he said ‘I’d go for the green chilli one because I like spice’. He clearly hadn’t tried it as it wasn’t spicy in the slightest, but the inclusion of fennel seeds was a nice touch. 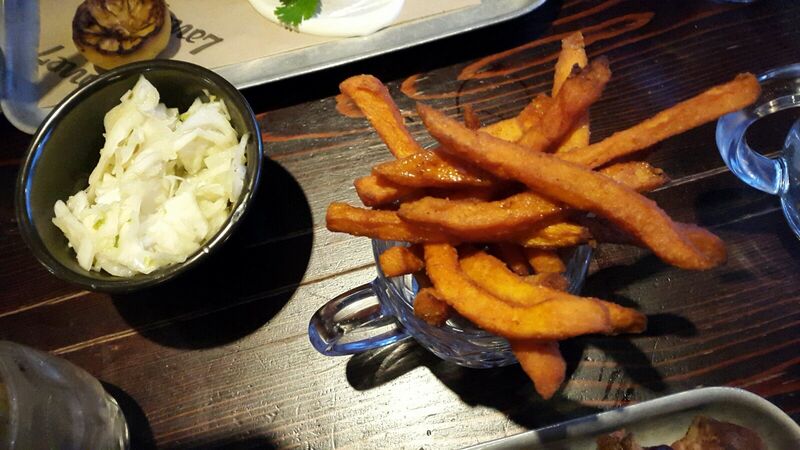 The sweet potato fries were cooked well. 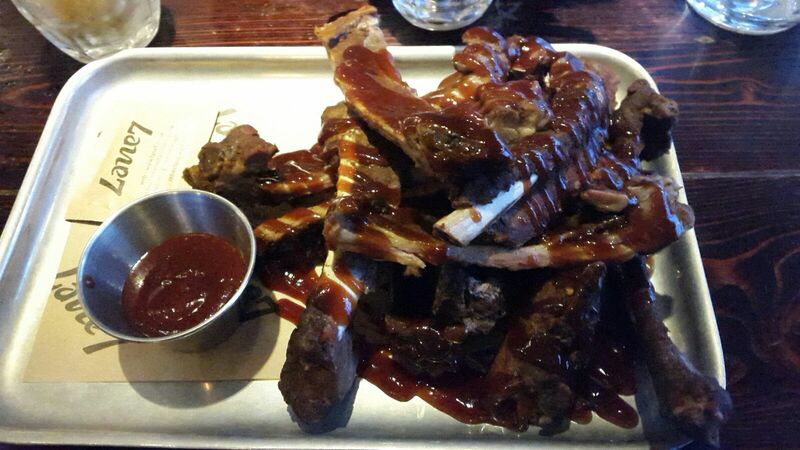 The Mr was presented with a huge trayful of ribs (the food comes on metal trays with an annoying piece of greaseproof paper which gets all wet and ripped when you cut into your food) #WeWantPlates. He was a little underwhelmed by the ribs; they were decent enough but not a stand out contender when the Newcastle dining scene is so over-saturated with BBQ joints (Bierex is the best in my opinion). His corn on the cob would’ve been excellent as it was nicely chargrilled but had been coated in loads of salt which rendered it practically inedible. We finished up (apart from the ribs, they defeated us!) and as the pool and ping pong tables were all booked up we settled on a game of PacMan on the retro arcade machine. I won at Pacman, natch. Overall we had a laugh bowling but were left a little underwhelmed by the dining experience. Perhaps this is due to Finnigan’s departure, and the changing of the guard – let’s hope so. It would be shame to lose sight of what made this place a success. Thanks for reading! Follow me on Twitter and Instagram for updates.